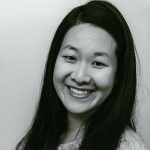 Published Apr 24, 2017 By Julia 10 CommentsThis post may contain affiliate links. I love these crazy good Hawaiian steak kabobs with fresh pineapples and bell peppers. They’re marinated with a homemade Hawaiian steak marinade and broiled in the oven. 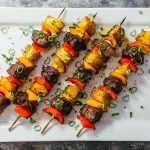 There isn’t a single thing that I would change about these Hawaiian steak kabobs: the steak bites are succulent and tender, the bell peppers and red onions are crisp and juicy, and the pineapples are sweet and smoky. These steak kabobs have Hawaiian written all over them from the moment you take a bite, and will be a huge hit at any summer party. 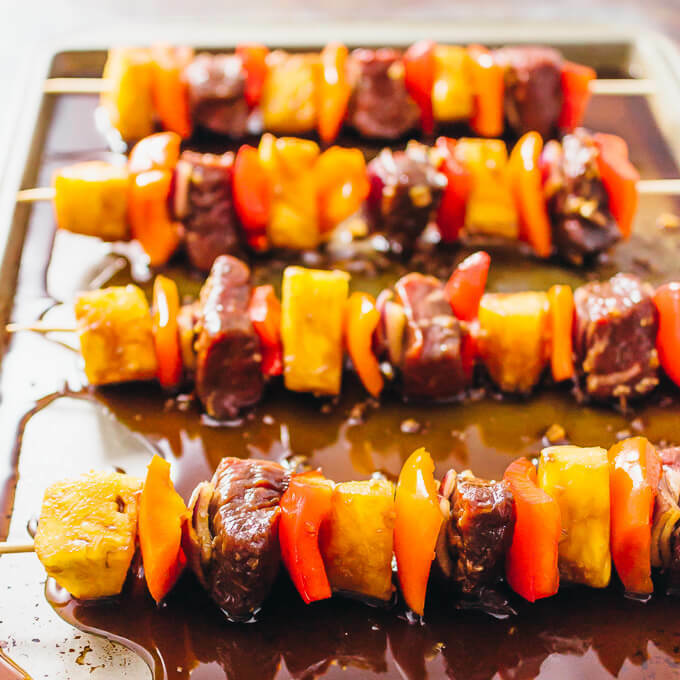 I also like making these steak kabobs for fast weeknight dinners for myself and Mr. Savory Tooth — it only takes me about 15 minutes to thread the skewers and another 10 minutes to cook the kabobs using the broiler. 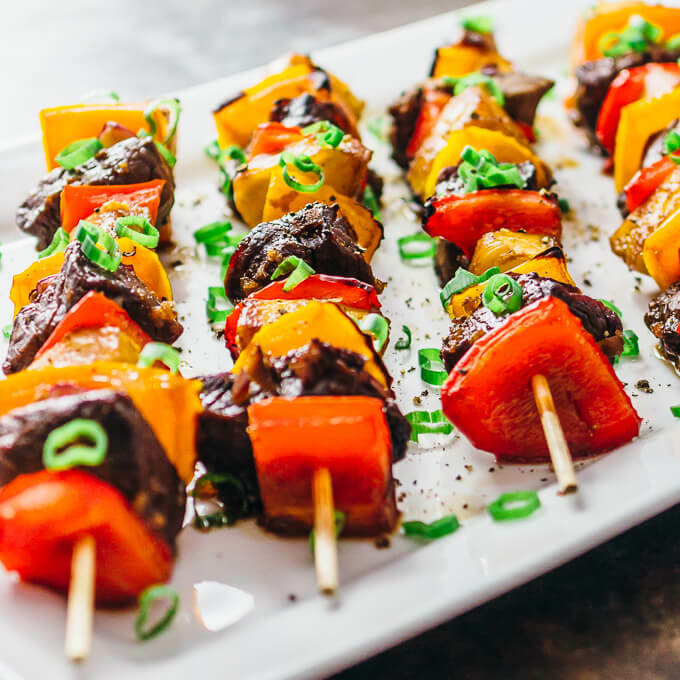 The beef chunks in these steak kabobs are incredibly tender and juicy — I used a top sirloin steak cut from PRE Brands, which is known for 100% grass fed beef from animals that are pasture raised and not given added hormones or antibiotics. PRE Brands has a high commitment to cattle welfare as well as consistency in the taste and freshness of their beef cuts. 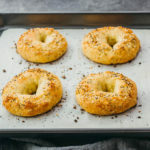 Their products are available in many large grocery chains throughout the U.S., including Shaw’s and Star Market stores. Check out their store locator to find a store near you. In addition to using quality beef, you’ll want to use this homemade Hawaiian steak marinade to make the steak kabobs extra tender and flavorful. This marinade has a lot of tasty ingredients: soy sauce, brown sugar, minced garlic, freshly squeezed orange juice, and minced ginger. To make the marinade, combine these ingredients in a saucepot and bring to a simmer before allowing to cool. This will make your kitchen smell fantastic, and I can’t wait to try this marinade with a host of other dishes. 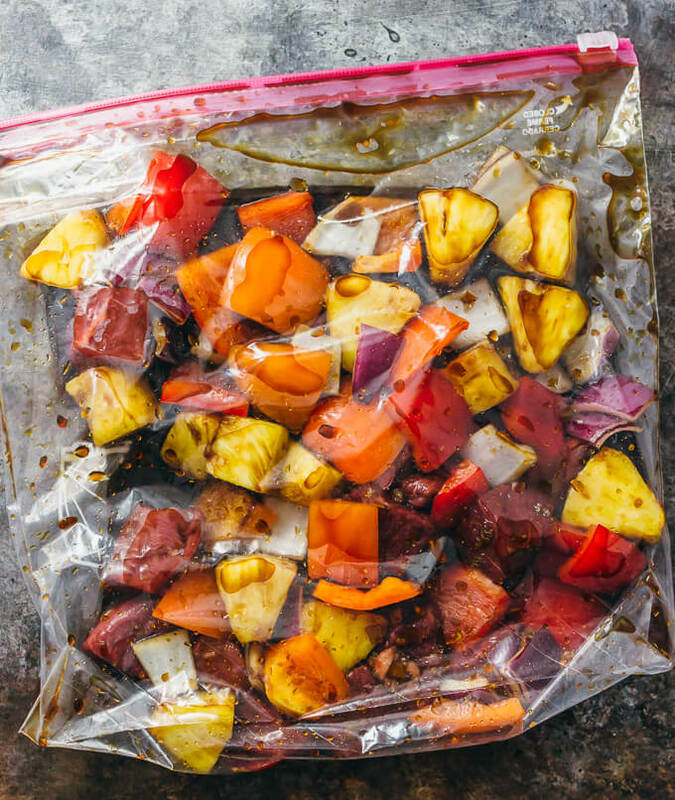 Once the marinade has cooled, I toss it with beef and everything else in a ziplock bag, and I let everything marinate for at least a few hours in the refrigerator. My favorite way of cooking steak kabobs is by broiling them in the oven. It’s faster than baking and easier than grilling. I set the oven rack about 6 inches below the flame, and I broil for about 5 minutes before flipping the skewers and broiling for another few minutes until a thermometer reads 145 F for medium doneness. 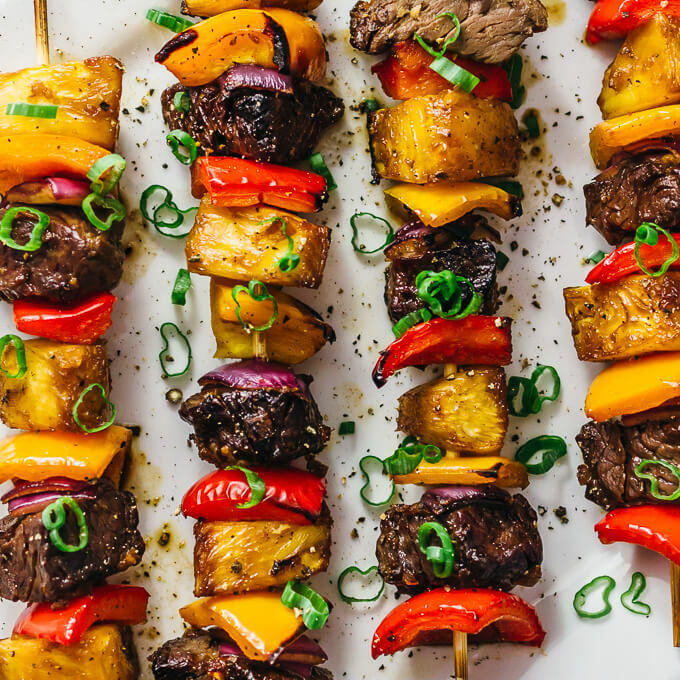 This produces perfectly cooked steak kabobs: the pineapple and bell peppers are slightly charred on the outside and super juicy on the inside, and the steak is melt-in-your-mouth tender. Yum. These kabobs would go amazingly well with a side of cold broccoli salad or a delicious pasta salad. Slice the steak and pineapple into 1-inch cubes so that there are 12 pieces each. Chop the red and orange bell peppers and red onion into 1-inch squares. Add steak, pineapples, bell peppers, and red onions to a ziplock bag. Add the marinade to the bag and toss with ingredients. Marinate in the refrigerator for at least 2 hours, flipping the bag halfway. Prepare 4 wooden skewers. Load the skewers by alternating between ingredients. Start with the red bell pepper, then the steak, red onion, orange bell pepper, and pineapple. Arrange the loaded skewers on a broiler-safe tray. Start the broiler and set the oven rack about 6 inches below the flame. Place the tray with skewers in the oven and broil for 5 minutes, flip the skewers, and broil for another 5 minutes until the steak reaches an internal temperature of 145 F (for medium doneness) and the vegetables are tender. Serve the kabobs on a platter. Sprinkle scallions and freshly ground black pepper on top. 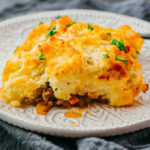 This recipe yields 47 g net carbs per serving. would this work if i incorporated shrimp? That should work fine, but the cooking times will change. You’ll have to take it out when the shrimp are cooked through. Should the shrimp be precooked? Hi! How important is the fresh ginger? I have dried/powdered ginger, but not fresh. Any thoughts? Hi Emily! I think replacing the fresh ginger with powdered is fine. The flavor won’t be quite the same, but it’ll still taste quite good. What do you think about grilling them on the BBQ? I’ve got my veggies and meat cut up, marinade done, and making this for dinner! Yes, grilling would work fantastically! Have you tried it with chicken? I haven’t, but I think that’s a great idea. Wow! That looks fantastic! I’m definitely making this! 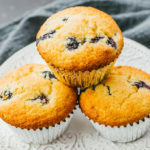 Thanks Julia for sharing this recipe.